Winter time can be one of the worst times to experience a breakdown, especially if you’re out in the middle of nowhere. Knowing how to get warm, if your car gets stranded in a winter storm, is going to be extremely important. Tips you should know, before heading out in the winter. Snow can keep you warm – Although it may seem strange, snow is actually a really good insulator. If there is enough snow in the area, you can bury your vehicle to help keep winter winds from stealing your vehicles trapped heat. Just make sure you create an airway for fresh air, and keep one of the doors free enough to get out. 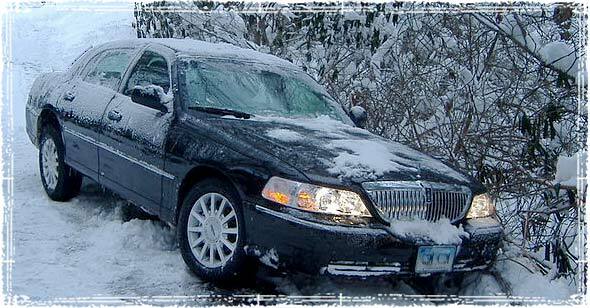 You will also want to create a way of signaling rescuers if your vehicle is hidden by snow. Block off unused space. Use anything at your disposal to block off any space in your vehicle that’s not being used. Blankets, leaves, and any materials that you can find, should be shoved into any spaces where heat can be lost. Run Your vehicle for 10 minutes every hour – Make sure to keep the exhaust pipe clear of snow or debris. Poison gases can enter into your car if the pipe is clogged. Bundle Up – Keep extra dry clothes, warm blankets, a sleeping bag, gloves, hats and winter socks in your vehicle. Never leave without a winter survival kit. – Being prepared is always the best course of action. Create a kit that can be stored in your trunk. The kit should contain warm clothes, tea light candles (for warmth), flares, tools, chains, Fix a Flat, and other winter survival tools. Huddle together. Huddling together in a small space can increase the amount of heat in that area. Remember to block off any space that’s not being used, then huddle closely together to generate more body heat. Don’t forget to move – Move your arms, hands legs, feet and toes to improve your circulation and to keep warm. Items you should have in your vehicles emergency kit. Good post, although I would recommend lots of caution using candles inside a car- a fire hazard and potential for suffocation. The foot/hand warmers are better as long as they last. You can get a big pack of them fairly cheap nowadays. As a former New Englander I also recommend a sturdy ice scraper/brush combo, a small folding shovel (like the military ones), and a bag of generic cat litter for emergency traction. 2. Keep water in your car, one of the easiest ways to get Hypothermia is to lower the core temperature by eating snow so don’t do it. If you have to east snow, bring the snow into the car first and let it melt and warm a little. 3. Don’t leave the car unless you have too, and then only when you know specifically where you are going. If you need to get your bearings or set a sign for others to find you do so in short small trips within eye sight of the car. Especially during white out conditions. 4. One last thing, in emergencies your priority is shelter, once you’re stuck the car is a shelter first a potentially recoverable vehicle second. Don’t be afraid to rip the cloth off the seats if you need to. jacket,gloves,and hats or passive heat. Candles don’t really provide much heat. Carry tea candles, a metal coffee can one quarter filled with sand. Old girlscout trick. when i get done doing my laundry, it seems like there is always a sock missing. so i put the mis matched socks in a bag all year, then in winter i just toss the bag of socks in the trunk. you can use them for feet or hands if needed. its cheap if you dont have much money for extra gloves just to keep in your car. also, i always end up with a lot of plastic bags from shopping trips. i take a pile of these and some rubber bands and put in the car too. just put your hand inside the bag then slide rubber band over your hand, up past your wrist, to hold the bag in place. you can also put the bags over your feet if needed. if you had to get out of the car, this would help keep hands an feet dry. Great Tip Sabrina, I always love when people offer cheap DIY tips. Great article with even better comments. Preserving heat any way you can is essential to survival. My thoughts on being stranded in a vehicle, it is the best shelter in an emergency situation. That is one good thing to take note of. Your mental status is also a key to survival and knowing you have the best shelter available is a positive mental note. I going to live in my car and have 10 days to prepare. What else can I do now to be ready. How long did you live in your car? Newspaper in the old days was a good insulator. Also bread bags worked inside boots to keep feet dry from deep snow. One friend lived in her car for a good while. She found an underground parking garage and pulled her car in there after workers that had rented spaces left for evening. Electric outlets were on some of the supporting columns, so janitors could plug in vacuums & other tools, so she plugged in an electric blanket. She always left before workers arrived in morning. She did know the head janitor at that building for a good while before she needed the garage for shelter. Janitors came in a few hours before anyone else, and he didn’t mind her staying there. She was going to college, and working – just needed to not spend as much money as living was taking. Bath? I don’t know how she managed that. Maybe restroom sink where she worked? A warm hat, hats hold in a lot of heat! A good tip is to stay in your car. Keep hand warmers in the car, they can provide heat for hours. No matter what, don’t ever eat the yellow snow. Ps. Thank you OffGrid Survival!! All helpful information, thanks OffGrid. I spent 15 hours in my 4×4 last Friday after running into a 4 feet x 600 feet snowdrift in a blizzard. No problems. First thing to remember is stay calm and think carefully what you’re going to do. Tips: 1. Stay calm. 2 Stay sheltered. 3. Stay warm. 4. Ration food and water. 5. Wait for clearer weather before venturing out. 6. Send GPS coordinates from smartphone to trusted person to aid rescuers.